Messy play ideas for babies and toddlers, plus tested ways to embrace and contain the mess. 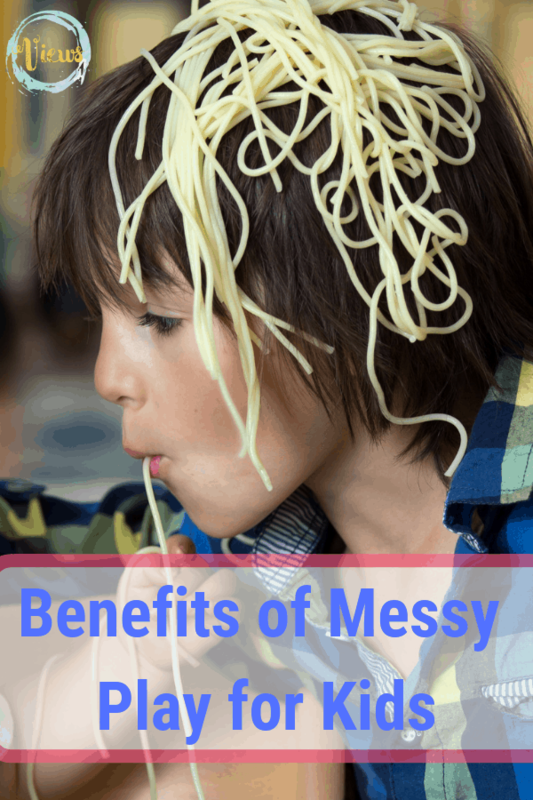 Read the benefits of messy play for kids! 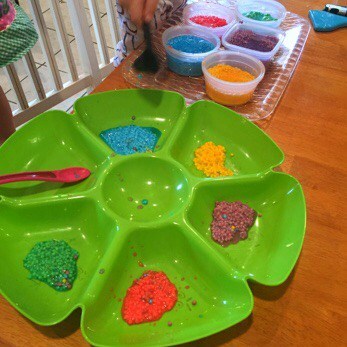 Sensory play for 1 year olds is critical…yet daunting. Often we turn to mess-free alternatives to avoid the mess and the choking hazards, but, allowing children to play freely and get messy is incredibly important to brain development and creative thinking. 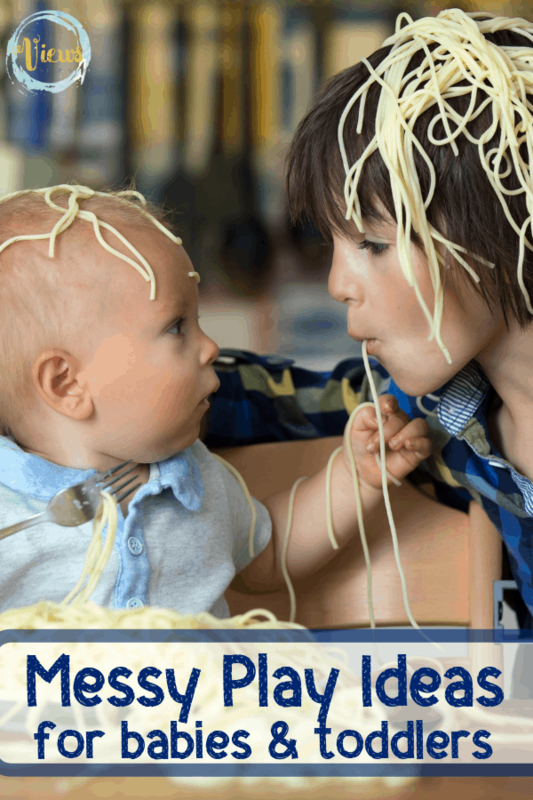 Why should I look for messy play ideas for babies and toddlers? As parents, we are exhausted and low on patience. The mere thought of intentionally creating more of a mess to clean up seems totally nuts. But, there are some ways you can minimize the mess made as a result of messy play, all while allowing your child to explore freely and creatively. So, why is messy play so important? In a nutshell, playing messy allows us to think messy. This is the type of thinking that allows of to be creative, to think critically, and to explore our environment inquisitively. 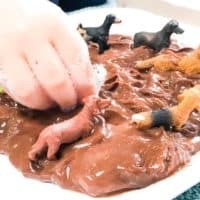 Additionally, messy play stimulates the senses, furthering the connections made in the brain when learning. Simply playing, and especially playing messily, is learning. Tips for embracing and containing the mess. I’m 100% for messy play. In fact, I encourage it. But, I do not like cleaning up messes. Especially those that are completely avoidable. So, I’m sharing with you a few of my favorite tips for embracing messy play with babies and toddlers. Take the messy play into the bathtub. Bathtubs are excellent for containing mess. Strip kids down to their diapers and let them sit in a dry bathtub for their messy play time. Sit at a highchair with a splat mat underneath. 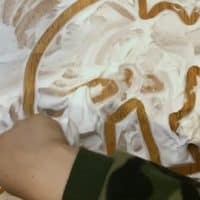 The Bumkins splat mats are still permanently under our sensory table, and were great under messy play time at the highchair when my kids were babies. Get outside! Messy play is best done outdoors. In many cases, the mess can be hosed off, making many messy play ideas excellent in the warmer months. Just embrace it. 😉 Easier said than done, for sure. Read up on some of the benefits here, and they just might outweigh the costs for you. Babies and toddlers love messy play! It’s natural for them to want to explore all that is around them, in any way possible. However, there still are some parameters to follow to keep messy play safe with this age group. In general, finding edible messy play ideas, or those that don’t contain small parts as choking hazards, are best. 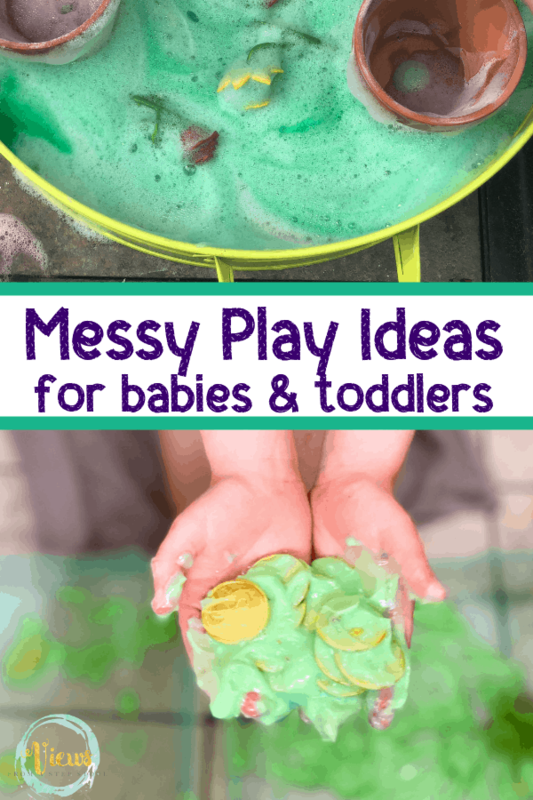 Messy play ideas for 1 year olds and toddlers. 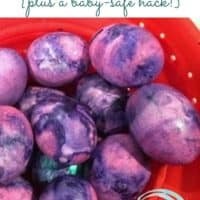 Sensory play and messy activities that babies will love. 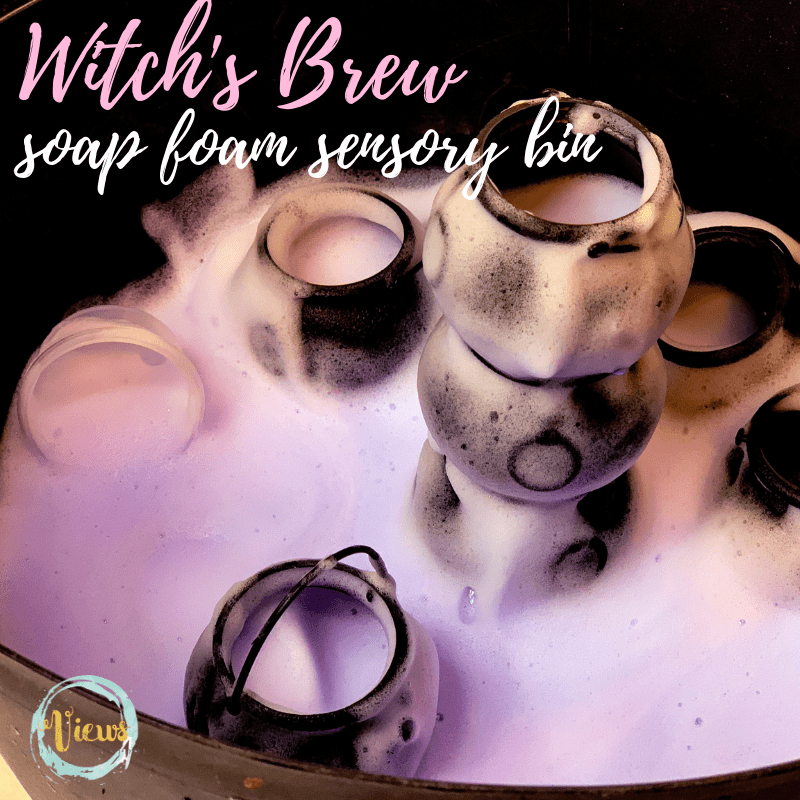 Halloween soap foam made with dish soap, water and cornstarch blended together to make a thick bubbly foam kids love. 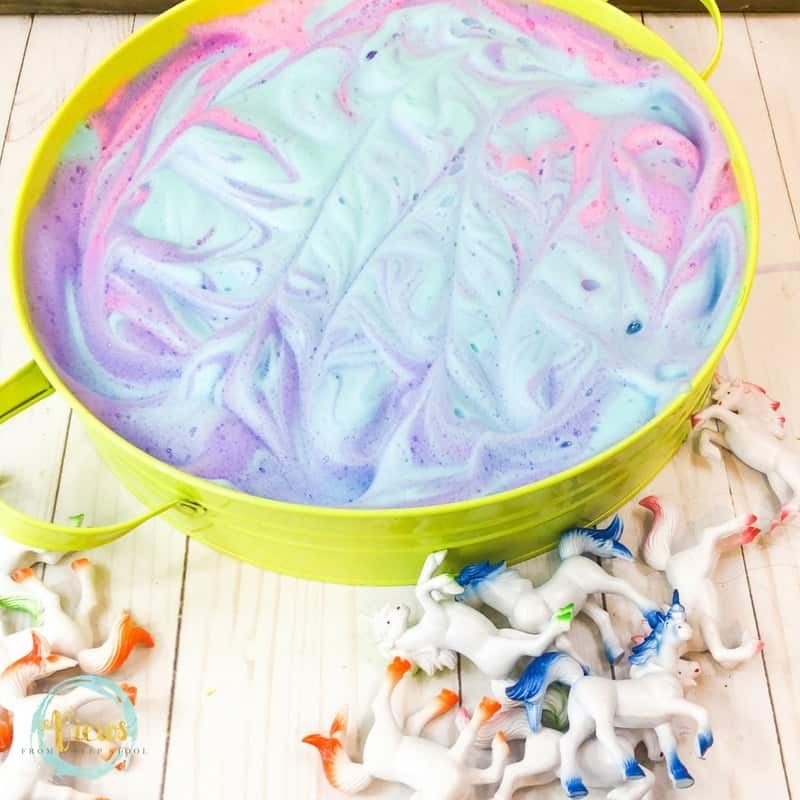 This soap foam recipe mixes soap and water with cornstarch to create foam that has a great texture. 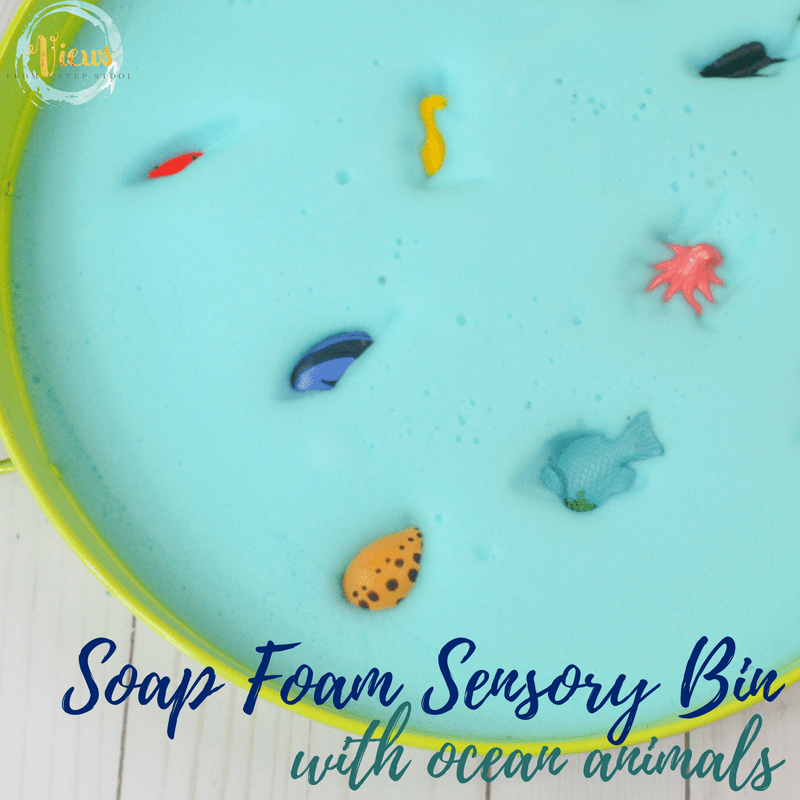 Color it blue and add sea animals for an ocean theme! 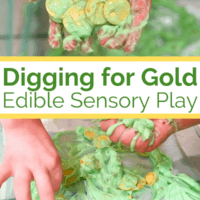 Edible sensory play perfect for babies and toddlers, as well as for older children. The perfect extension activity to the book, Harry the Dirty Dog. 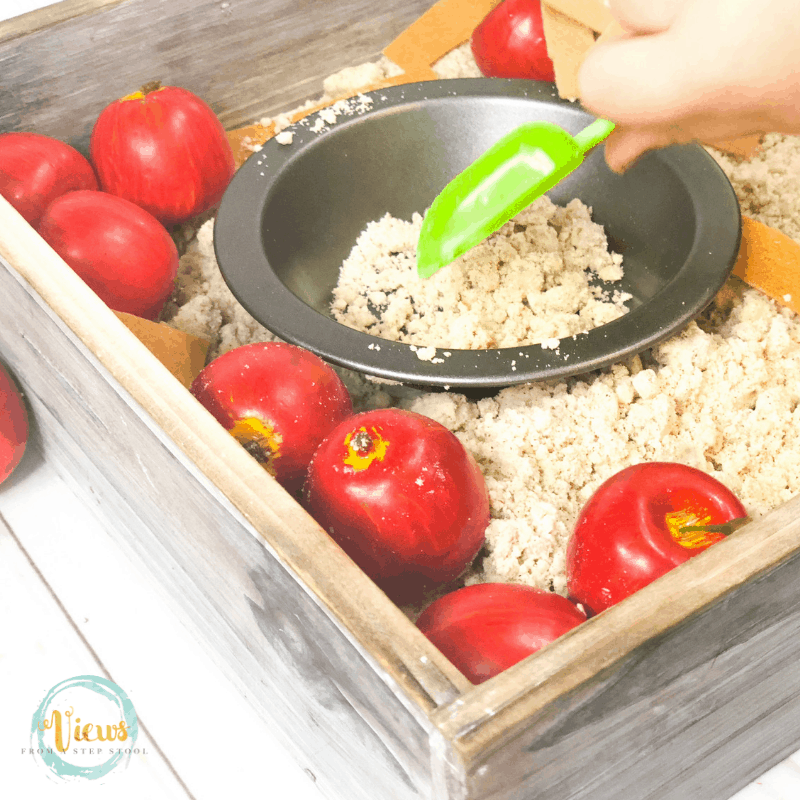 This apple pie sensory bin includes scented 3-ingredient cloud dough to create fine motor and pretend play for kids. To play with the book Ten Apples Up On Top. 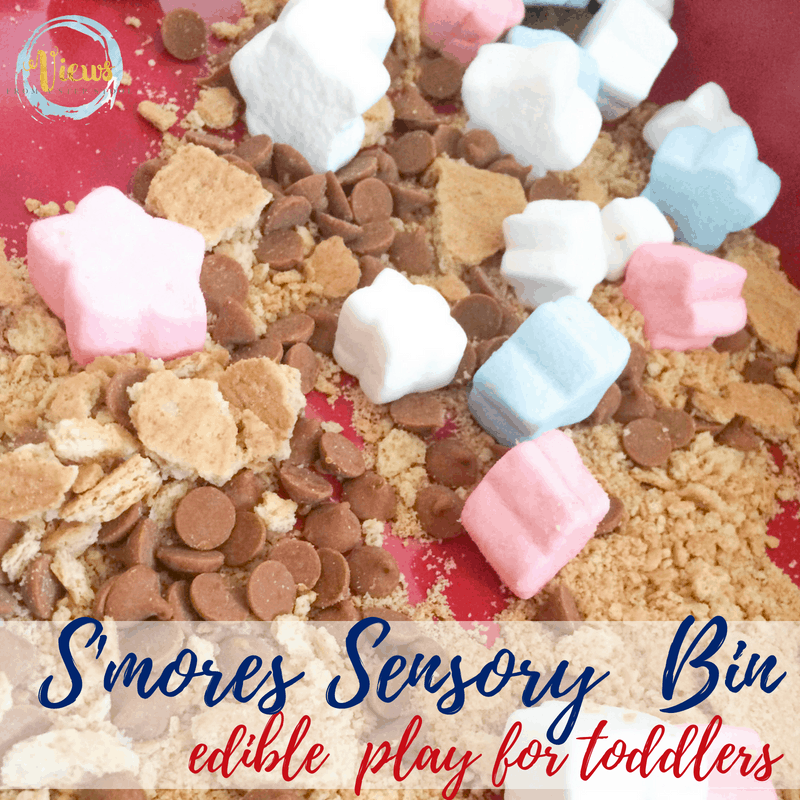 Edible S'mores Sensory Bin: Perfect for Toddlers! 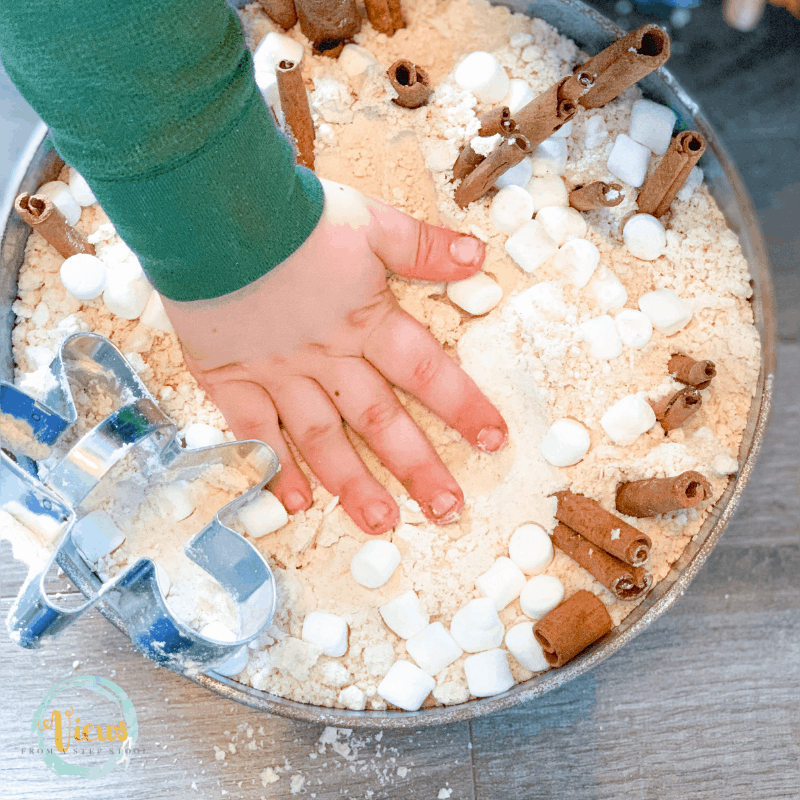 This s’mores sensory bin combines graham crackers, marshmallows and chocolate chips to create a fun and tasty edible sensory bin perfect for toddlers. Water beads made from tapioca pearls, making a safe alternative for water bead play with babies. 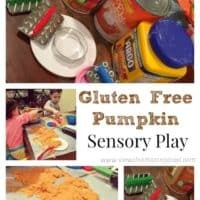 Canned pumpkin mixed with cornstarch makes a great squishy play dough for babies. 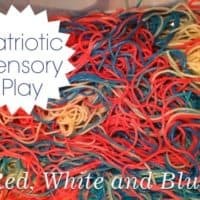 Our red, white and blue spaghetti is a really fun way to make some patriotic sensory play! 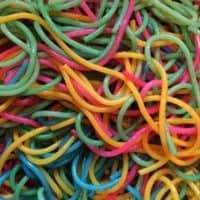 Colored spaghetti is so easy to make and the kids just love it. 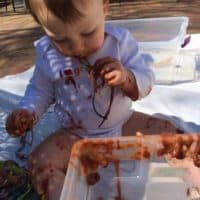 Chocolate pudding as dirt serves as a base for this edible garden sensory bin for babies and toddlers. Roll some hard boiled eggs around in this marbled Cool Whip! Rainbow colored cooked pasta for sensory play with babies and toddlers. 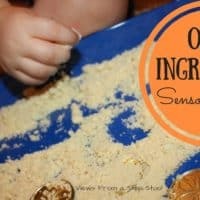 Grind up some of baby's favorite dry cereal to make indoor sensory sand. 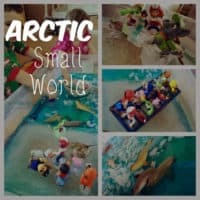 Ice and water make great sensory play for babies indoor in the Winter or outside in the summer. Make a batch of homemade paint with flour! Get a box with a lid and shake up some marble painting with this edible paint. Spread shaving cream on a table and allow babies to draw in the cream. If your child might try to eat this, substitute whipped cream instead. Pistachio pudding for digging for gold treasure in! This non-Newtonian fluid is perfect for babies! 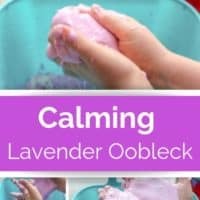 Plus, the addition of lavender is calming. Have so much fun embracing messy play ideas for 1 year olds. Your babies and toddlers will be so happy!